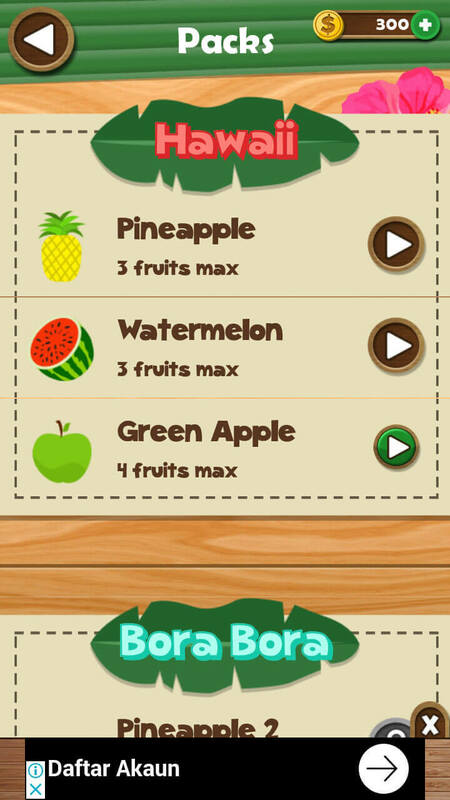 Word Beach is a pretty fun and colorful word puzzle game with a relaxing tropical theme. 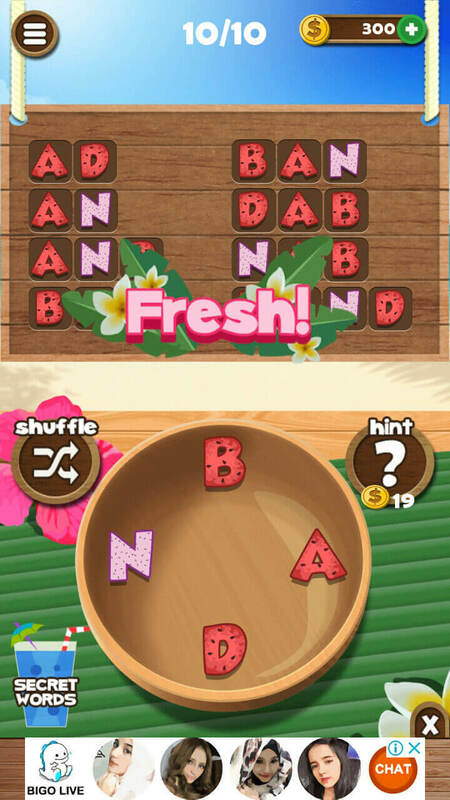 In this game, you’ll need to swipe the letters on the wooden plate to form words that are needed to complete a level. By looking at some of the game’s screenshots, you’ll probably be going… “uh huh, another copy-and-paste word game? Never mind, I’ll pass.” But trust me when I say this game may not be 100% unique in any way, especially when it comes to how the game is played but the puzzles it provides are refreshingly new enough (not all though) to keep you engaged. This is actually one of my main bones to pick when it comes to word games and if you have played as many mobile word games as I do, you’ll probably understand. Just so many of these games simply copy each other’s puzzles and have not bothered to come up with new ones of their own. Most of these games just feel the same right from the start and this feeling persisted throughout the game. However, in Word Beach, the puzzles do feel different. I won’t go as far as to say 100% of the puzzles are unique but even if 10% are different, it’s enough to give you something new to actually challenge your mind. But of course, similar to many other word games, Word Beach does start you off with the easier puzzles so you’ll be ease gently into their tougher ones later down the road. Even if you do encounter a tough puzzle that seems to foil all of your attempts to solve it, know that the game provides you with hints and shuffles to use. Shuffles are generally free to use since you will still need to put in a bit more effort to figure out the answers. However, hints in this game aren’t too expensive either. Unlike the usual 50 to 80 coins, you only need 19 coins (an odd number to set a price as) to buy a hint. Each hint you buy will slowly uncover each letter of a random word you have not yet found. Found a valid word that isn’t in the puzzle you need to solve? Why… you’ve just found a Secret Word! 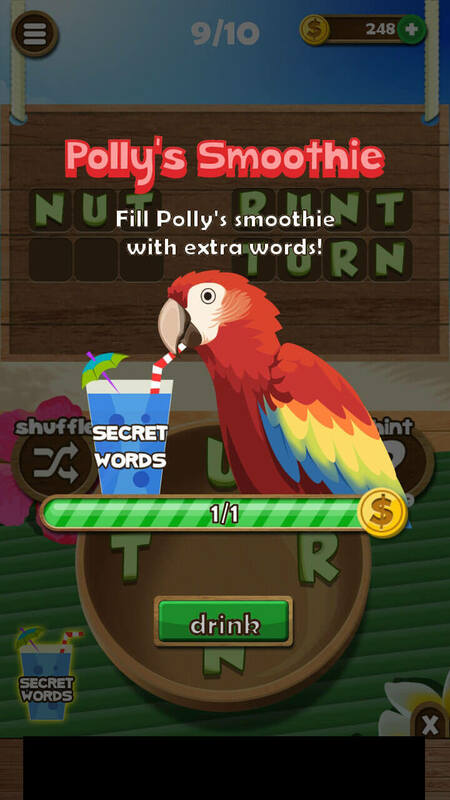 Secret Words are the “bonus words” in most word games, where you can accumulate them through a meter of sorts, which in this case is called the “Secret Words Smoothie”, to redeem extra coins. Another great thing about Word Beach is that it breaks down its levels into smaller chunks. So, basically, you’ll be traveling to various tropical locations with each location containing multiple stages named after tropical fruits. Each stage, in turn, contains several levels. You’ll definitely have tons of word puzzles to play before you run out! There are no restrictions in place either. As long as you can solve a level, you’ll be able to proceed to the next one. Being a freemium game, Word Beach contains ads. The permanent banner ads appear at the bottom of the screen and do not affect your gameplay in any way, but there are times when full-screen ads will pop up. These usually come with an “X” icon which you can then use to close the ad. However, if ads are incredibly annoying to you, you can always spend real money to buy the ad-free version of the game. Now, aside from its slightly different puzzles, Word Beach also has a rather unique look… visually, that is. I like how they modeled the letters to appear like sliced fruits. This little change gives a bit more color to generally dull-looking letters without going overboard with it. The tropical music that plays in the background is pretty nice too. It does bring out the tropical atmosphere of the game. All in all, Word Beach is a pretty generic word-finding game where you simply need to swipe to connect letters to form the words you need to solve a level. In terms of the game mechanics, the game isn’t at all unique – though, I’d like to point out that their hints cost a lot less than many other word games – but the game got one thing right that many other “generic” word games don’t – they are willing to go that extra mile to actually provide puzzles that aren’t 100% the same as many other games. This alone makes Word Beach worth a try. Of course, its colorful, tropical theme is also a great bonus.